The Trump motorcade missed the protest. 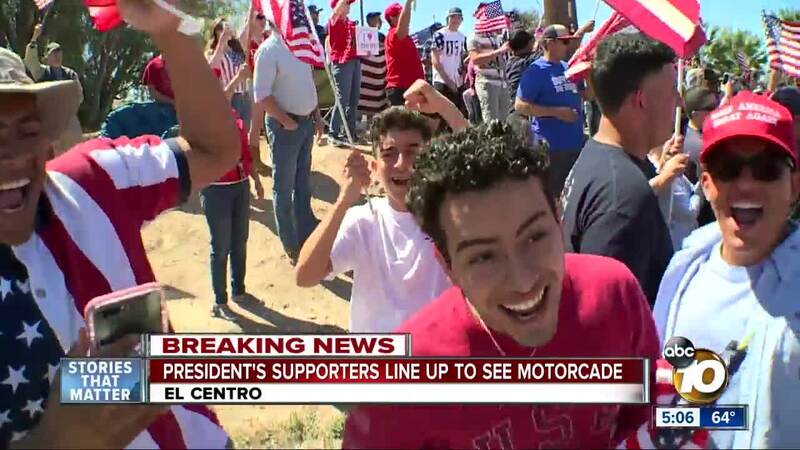 CALEXICO, Calif. (KGTV) — Supporters and opponents of President Donald Trump gathered at the U.S.-Mexico border in Calexico Friday, ahead of the President's tour of a section of border barrier. 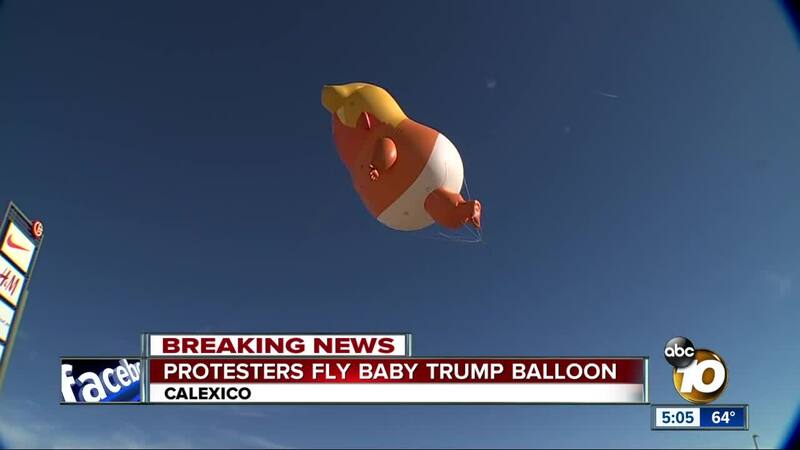 Before the President touched down, opponents inflated a large "Baby Trump" balloon, which has become a symbol of the President's protesters around the country, outside the Gran Plaza Outlets in Calexico. Just a few miles away, supporters donning "Make American Great Again" hats and Trump flags gathered to welcome the President to town. The President's backers added they want to see immigration reform come from the visit to the border town. Both groups are hopeful President Trump flies over to see their demonstrations. Trump is expected to tour a section of 30-foot high, 2.5-mile long steel replacement wall recently installed. Calexico's new wall includes wire in front and along the top, as well as a plaque proclaiming it to be the first section of the President's proposed border wall. Though, the wall was requested during President Obama's time in office, and eventually funded and constructed during Trump's presidency. Trump's administration is also in the process of replacing 14 miles of fencing in San Diego County along the border with Mexico. President Trump is also expected to meet with local and federal law enforcement officials to discuss border-related issues. Following his Calexico tour, President Trump is scheduled to head to Beverly Hills for a campaign fundraiser.